A quality management system (QMS) is a set of policies, processes and procedures required for planning and execution of production/development/service in the organization's core business areas. 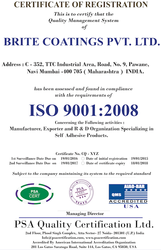 Our facilities are ISO 9001:2015 QMS certified. All due processes are technologically well defined and environmentally conscious. Products are developed after proper market testing and extensive field-testing with end-customers. We have predefined SOPs in place for each area of core business activity which ensures consistency in our products. 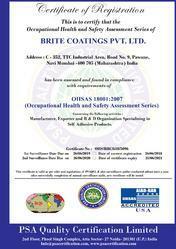 Brite Coatings has fulfilled the requirements for OHSAS 18001 and has been awarded a certificate of compliance. OHSAS stands for Occupational Health and Safety Assessment Series, (officially BS OHSAS 18001) it is an internationally applied standard for occupational health and safety management systems. Organizations certified as OHSAS compliant provide safer work environments and have proper management policies related to the safety of the workforce. Six Sigma is a method that provides organizations with tools to improve the capability of their business processes. This increase in performance and decrease in process variation leads to defect reduction and improvement in profits, employee morale, and quality of products or services. A six sigma process is one in which 99.99966% of all opportunities are statistically expected to be free of defects (3.4 defective features per million opportunities). 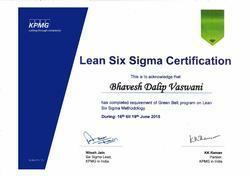 Mr. Bhavesh Vaswani being a six sigma qualified individual from the executive leadership is responsible for setting up a vision for Six Sigma implementation. At Brite Coatings we aim to empower the stakeholders in various fields ranging from R&D, production, plant maintenance, accounting best practices etc. by giving a sense of ownership of the process to individual employees to further improve their own functioning or the functioning of their related departments by making available resources and an environment of continuous improvement. Brite Coatings is an Active member of Federation of Indian Export Organizations (FIEO).